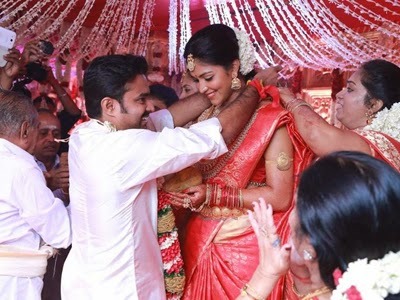 Southern actress Amala Paul married Tamil filmmaker Vijay here Thursday in a traditional south Indian style wedding. The occasion was graced by many members of the Tamil film fraternity.While Amala was dressed in a red Kanjivaram sari, Vijay was draped in a sparkling white dhoti and shirt. The couple will host a grand reception Thursday evening, for which Amala will be seen in designer Sabyasachi Mukherjee's creation. She will be decorated with jewels from Amrapali and Joy Lukas. Industry members who attended the wedding and blessed the couple included Mani Ratnam, Jagapathi Babu, Vikram, Arya, Bala, Jeyam Raja, Abbas, Krish, Sangeetha Krish and Samuthirakani. Vijay and Amala recently got engaged in Kerala in a church. They fell in love on sets of Tamil film "Deiva Thirumagal" and have been dating for nearly three years.